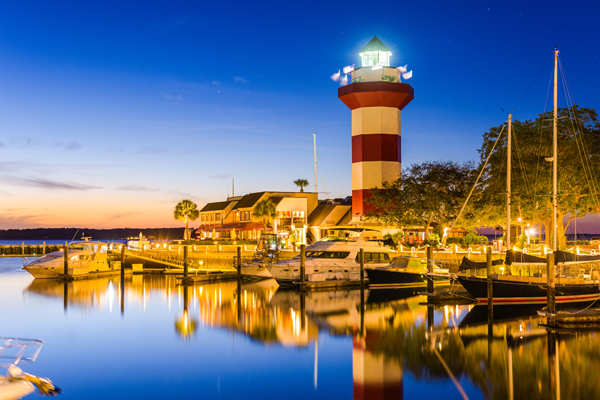 Located in the renowned South Carolina Lowcountry, Hilton Head Island is the ultimate island retreat and truly a wonderful place to call home! The island community has over 12 miles of beautiful Carolina beachfront and is home to dozens of world-glass golf courses and tennis facilities, and many great restaurants where the local ‘catch of the day’ is always served daily. Great for outdoor enthusiasts, the island offers many opportunities for fun in the sun. Relax on the white, sandy Carolina beach or take to the waters off Hilton Head for a fun boat cruise or fishing trip. Walk, jog, or ride your bike on the many bike paths that span the island and enjoy the wildlife and natural surroundings. If golf or tennis is your game, you will love the many world-class courses and facilities nearby. Real estate opportunities on Hilton Head Island vary as there are a wide variety of properties and lifestyles to choose from. The vast majority of homes on the island are located in golf and water-oriented gated communities such as Sea Pines, Hilton Head Plantation, and Port Royal Plantation to name a few. Vacation homes, villas, and townhomes are also very popular on the island, and they are great for investor buyers as the short-term rental market is very dependable. If you are considering relocating or buying a vacation property on Hilton Head Island, please CONTACT US and let a Hilton Head Island expert help you today! CLICK HERE to view all current real estate opportunities on Hilton Head Island!